If you care your bike a lot, you should maintain and care about your engine or every piece that makes your motorcycle safe to ride. As a basic maintenance or as your SOP, you should always scheduled your engine for checking and fixing things for safety like changing oil or tuning up. But first, you need to learn a lot from the expert. You should ask them and get some necessary tips and information you need to know about motorcycle and so on. Here, is the basic information you need to know and you can do it own yourself. 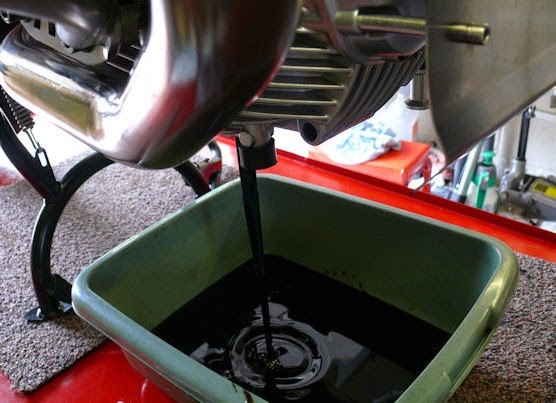 This is a basic and actual Oil change procedure for you motorcycle. As you know what kind of oil you are going to use as per expert suggestion, choose an oil that will suit your likes. Its either suit your budget or for the best reason. Okay, we will assume you are going to use any kind of oil for oil change. Also, you can scheduled your oil change based on the suggestion but it's up to you if you prefer to do it monthly. But most of the time, most motorcycle owner prefers every 2000 miles for oil change. Take time to check your oil filter if it is still good for the engine. If not, you can change it preferably according to your motorcycle model and brand. Take time to watch this very informative video to help you on how to change oil out of your motorcycle. Watch the video carefully to learn on how to change your oil out your engine. For more motorcycle tips, just stay tune read more updates here in Rider's Digest!